ecently, my ninety-five-year-old mother passed away. Whilegoing through her things, I found myself in the grip of many memories as I worked my way through old pictures, newspaper clippings, and other memorabilia. But when I came across ration books and ration tokens from World War II, I had to stop sorting things and just let the memories flow. There they were, four ration books, each with our names on them; one for my mother, my father, my sister and myself. Some of the coupons were torn out. 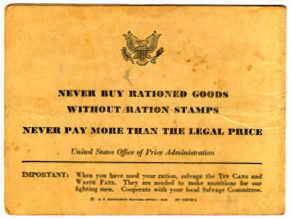 Obviously they had long ago been used to buy butter, meat or some other rationed product. I experienced a vivid memory of a butcher shop that was in West Farms Square when I was a child during those days. I have never forgotten this shop for two reasons: first, there was sawdust on the floor! Imagine that, sawdust on the floor that was not swept clean. Iit sure would have been swept if it were in my mother’s apartment; and second, the butcher would hang young lambs and chickens by their necks on hooks for his customers to see and to choose what cuts of meat or which chicken they wanted. Into the shop we would go with my mother, who would be clutching her ration books and tokens to buy the day’s supper. I would shut my eyes tight trying very hard not to look at the carcasses hanging on these hooks. Somehow I always thought that those little lambs were looking right at me with their soft, brown, accusing eyes as I passed. The chickens did not seem to bother me as much. My mother would tear off the necessary coupons and carefully put the coupon book back into her purse, make her selection and out we would go - me with my eyes again tightly shut. Usually, after the butcher shop, we would go to the hardware store which was down the street. There was always something that was needed for our apartment from this store: nails, screws and my all-time favorite, sandpaper, as we were always refinishing something. The sandpaper was on huge rolls and the shopkeeper would slowly roll out how much you had asked for. I was fascinated that he seemed to know exactly the right amount without ever measuring it. The large barrels of nails were also among my favorites. How many nails were in each barrel, I always wondered, and how long would it take to count them out? I never had the time to find out. The hardware store was directly across West Farms Square from the West Farms Bowling Alley. Sometimes, if I was lucky, I could talk my mother into crossing the square and peeking into the alley to see who was bowling. The smell of the banana oil they use to use to polish the lanes still lingers in my nose. Our last stop would usually be the grocery store down on Tremont Avenue. Our apartment was on 178th Street and Tremont, and the grocer was right on the corner. Out would come the ration books and tokens again, but this time there were no animals looking at me with their sad eyes. Instead, right there on the counter, within easy grasp of my little fingers, were the little fruit pies that sold for ten cents. Oh, how I loved those pies, especially the cherry pies. My mother would say to me before we even walked into the store, “No pies today. That ten cents adds up, you know.” But I just could not resist, and as soon as I saw those pies I would start whining and nagging for one. “Just this one more time, mom, I promise, I won’t ask again.” Sometimes she would relent, most times not. When we were all done, and the coupon book and tokens were safely back in her purse, home we would go. I would then be off to whatever adventure awaited me that day. As I was holding this long ago used coupon book and the tokens, I found that there were tears streaming down my face. How nice to remember my mother when she was young and full of life. How nice to remember that time so long ago that was so special to me. I won’t ever forget those memories and I will never throw away that coupon book or those tokens.